Well, not really, as anyone who lives here will tell you. But it has been sunny all week, and that’s enough for me! 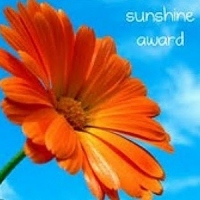 It’s sunny here on making the mundane magical, too, thanks to Debra Kristi, who last month awarded me the Sunshine Award! How cool is that? Thanks a bunch, Debra! And everyone else, if you haven’t been to Debra’s blog yet, you should check it out! Every week for Immortal Monday she gives us the lowdown on a different immortal character from mythology, movies, and/or books – I always learn something! Include the award logo in the post. Link back and thank those that nominated me. Answer 10 random questions about myself and/or tell seven random facts. Nominate 10 other bloggers and link them to the award in their comments section. What’s one of your favorite books from childhood? Just one? Okay, I’ll go with the first one I can remember: “The Cold-Blooded Penguin.” I blogged about it a few months ago. While it did exist as a standalone book, my copy of my favorite story was part of an anthology called Stories from Other Lands. What are you reading right now? On the treadmill and netbook, I’m reading The Ruby Brooch by Katherine Logan. Print book by my bed: Heart Change, by Robin D. Owens. Which do you prefer, Facebook or Twitter? I’m on both, and really, it depends on what I’m doing. If I’m reading the news or blogs and want to share, Twitter. If I just want to skim and catch up with what friends are doing, Facebook. Favorite thing to do in your free time? Uh… well, it’s hard to come by these days, but somehow I usually manage to make some time for computer games, especially time management games (maybe I should take a hint from that in real life? LOL). Favorite magazine? I used to read a bunch of them before I started writing. But now, only one, so I guess that’s it: Romance Writers Report, the official magazine of Romance Writers of America. Favorite teacher (and why)? Miss Phillips, my French teacher freshman, sophomore, and junior year, and English teacher senior year. She had a great sense of humor, and let me write papers about Rush songs. What is your favorite number? 9. Always has been. I’m not sure why. Do you prefer reading short stories or novels? Novels. I love an involved plot and really getting to know the characters. Bonus: What is your favorite flower? Either Stargazer lily or gladiolas. And this is the point where I break the rules. Most people I know who blog have already been nominated for this or similar recently, so anyone who wants to play along, consider yourself tagged. Otherwise, maybe you’d like to answer one or more of these questions in the comments? I’d love to hear from you! This entry was posted in Blog and tagged author, good books, Jennette Marie Powell, sunshine award, time travel, writer. I had no idea gerbils purred. That is just too sweet! Favorite book from childhood? Several. Half-Magic was wonderful. The Wonderful Flight to the Mushroom Planet set me on a love for science fiction. Burgess animal stories, several books, were my favorites in earlier grade school. And science books! Favorite childhood book? Probably James and the Giant Peach (with color illustrations). My grandmother gave it to me and I still have it. Favorite number? 18. It was the day I was born. Favorite thing to do in free time? READ! Michele and Stacy, thanks for sharing! I’m reading right now Michael Hyatt’s Platform: Get Noticed In A Noisy World. I’m learning so much. I highly recommend the book to all bloggers and writers. Magazine reading is one of my favorite hobbies beside blog reading. I have culled down my subscriptions considerably but I still read a handful every month. Thanks for this list, Jeanette, the smiles and the memories. You definitely deserve the SunShine Award. I never would have guessed gerbils. I don’t know why, just wouldn’t have. They are adorable. I, too, love the stargazer lily. But I now associate it with a guy I wasn’t terribly fond of that kept buying them for me years ago. Ugh. You know that guy that just won’t take the hint – or the straight out rejection? Anyway… I LOVE that your teacher allowed you write about Rush songs. How cool is that??? Way cool! I guess your teacher knew there was a better chance of you turning in a great paper if your passion was behind it the subject matter. Smart. Thanks for sharing Jennette! Spring is also my favorite season, for many of the same reasons you listed. Also, here in South Texas, it’s warm enough to go to the beach but not so dang hot that your eyeballs sweat every time you step outside. Most of the questions above would be easy for me to answer, but the Favorite Teacher one gave me pause. I am blessed that there are a few fabulous teachers in my past who would compete for that honor. However, the most impactful teacher I had was my choir director who happened to share my name (no relation): Sandra Glover. She went beyond teaching music; she taught kids. She taught us hard work, character, team effort, courtesy and respect, and to enjoy ourselves. She was a “go big or go home” kind of woman, and her enthusiasm was contagious. Thanks, Sandra! You deserve a little sunshine, Jennette! Congrats. Thanks, Debra – and thanks again for honoring me with the award! Julie, my daughter’s in a community children’s choir, and while she hasn’t had a teacher that’s had the kind of impact yours has, it’s been a wonderful experience for her. Thanks for sharing!